Halloween is around the corner, and although I won't be dressing up this year, I'm thinking about getting my kicks in by finding a cute dog costume to parade my Chopper around in. For me it was a l-o-n-g work week, one that continues tonight when I catch the red eye to New York. I was able to put press releases and product launches out of my head for a few minutes to laugh at some adorable and completely ridiculous dog costumes online. Among my favorites not shown are Bacon Boy and Doggy Dorothy. So, what do you say about pet costumes: Doggy Do or Doggy Don't? Oh my gosh these are too cute! I love there Where's Waldo one! aawww that is just cute! This is way too cute. Adorable photos!! Total do. If I had a dog (and trust me, I wish I did), it would definitely be Where's Waldo this Halloween! The Marilyn Monroe costume cracked me up! This might be the funniest post ever!!! THANK YOU for sharing & for the laugh! Ohhh goodness, This is hilarious! 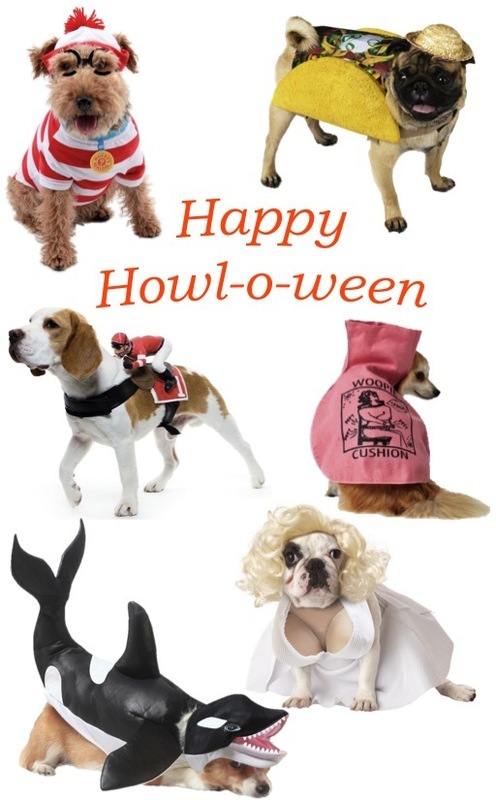 Haha I love dog costumes~ I just bought my two dauchshunds a hot dog and a devil costume! Too funny! Its funny watching them dress up in them. AH! that Marylin is hilarious! !